Remember a while back when I had the picture of the guy levitating and it looked so real? 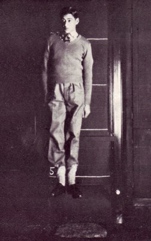 Well, in a 1939 Journal for the Society for Psychical Research, they had an article showing how pictures like this are done/faked. The person here has actually jumped, not levitated. You take the picture when they’re on the downside of the jump, and if they put their toes up and arms down it looks like they are levitating. It doesn’t look like a jump. Doesn’t it look like this guy is just hovering there? Today, as a reward for all my housecleaning this weekend, I am having a spa day. It’s just a day I occasionally designate as a pampering day. Among other things, I’m going to a salon to get highlights, and later I will lay around and read things like People Magazine. While eating Cheetos.